The second quick top I made over the Thanksgiving weekend was from the most recent BurdaStyle Magazine. I had a sort of love-hate relationship with the ruffle sweater top. But I was intrigued and it seemed quick enough so I thought I’d give it a try. Pattern Description: Women’s sweater top with sleeve ruffle detail. Pattern Sizing: Burda sizes 36-44. I made a size 40, grading out to a 44 at the sleeves and a 42 at the hip. Were the instructions easy to follow? Super easy. This would be a great pattern for someone new to BurdaStyle Magazine. Did it look like the photo/drawing on the envelope once you were done with it? Yes, I think it looks pretty similar. My fabric grows like crazy when you look at it funny, so my version might be a bit bagged out, but otherwise it is very similar. What did you particularly like or dislike about this pattern? Likes: It is easy to put together, it is oversized and slouchy, and it is very long, with nice deep hem allowances. Dislikes: I’m still not sure if I like the ruffled sleeves, but I saw other variations on this trend that looked cute, and I wanted to experiment. I went into it not sure how I’d like the style, so that isn’t a fault of the pattern, just my desire for experimentation. I’m still a bit on the fence as to whether I actually like it or not. Fabric used: Leftover sweater knit of unknown fiber content from the Michael Levine Loft. I used this fabric previously on a top from my Wardrobe Sudoku contest. I love the colors and stripes, and it is super soft, but it grows like crazy. I spent a long time matching all of the stripes down the side, so of course they came out completely mismatched after I’d sewn it. I didn’t think it was worth picking it all apart to redo, so I left it. It was a problem I sort of knew I’d have, and I wanted to try this style out on a less precious stash fabric, so the result is not brilliant, but more so that good enough is good enough. Pattern alterations or any design changes you made: None. Other than grading between sizes, and finishing the ruffle edges with a serger I made no changes to the pattern. Would you sew it again? Would you recommend it to others? I think this might look better in a solid than in the stripe I used? If the style grows on me I’d make it again, as it is quite comfortable. At this point, though, I’d re-draft the sleeve into a single piece and leave off the ruffle. Then I’d wear this obsessively. The ruffles were an experiment, but I’m not loving them. 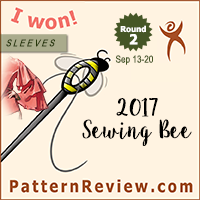 I’d recommend this pattern if you like the style though – it is a quick sew and very comfortable to wear. Conclusion: This was a style experiment, so I’m glad I made this top, if only for the ability to test out this trend. Although I could find myself wearing it quite a bit over the next few months, as I tend to wear clothing I’ve made quite a bit, even if I don’t love it right away, I think it might find a better home with my friend, who really wants one. She’s obsessed with this top, and I’m a bit ambivalent. Although I haven’t gone full Konmari method on my wardrobe yet, I can already tell that this top doesn’t quite “spark joy” for me as much as it does for her. It would probably find a better home there, so I might gift it to her after a wash. 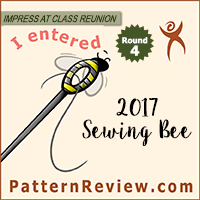 The If you like this pattern I’d definitely give it a go – it’s quick to whip up with a serger and coverstitch, and it’s a very comfortable style. Lovely sweater! Actually, those frills make the top much more interesting, otherwise you end up having an endless run of t-shirt thingies. Might try this m’self. I put this on my maybe list. I like slouchy-sweater feel and love the sleeve ruffles, wasn’t as crazy about the ruffles at the raglans. I’ll have to think on it!! It is cute and comfy though! And good idea to gift it if someone else loves it more. It’s nice when things we don’t love can find a home! It’s much better than the magazine version- good fabric choice! I’m still not 100% convinced by the ruffles I’m afraid. But I like the colours on you. Yeah, if it weren’t for the ruffles I think it would be perfect. My friend really wants one, so I think she’ll enjoy it much more than I will. When I saw this in Burda mag I thought it needs either just ruffles on the raglan or ruffles on the sleeves not both but I’m torn as to which would work best. I think the addition of some ruffles elevates a plain T-shirt for a change and makes it more current. I’m with you regarding ruffles, they just don’t suit me. I love your stripes and having them almost match is just like RTW! I recently made up a raglan sweater, also slouchy and very comfortable. I can see a few more coming my way. What KS said, I love the sleeve ruffles, but the raglan ruffles not so much. Which is odd, cause I haven’t warmed to the crazy sleeve trend at all. Having said that I just might have to make this. I would never have looked at it if you hadn’t made it. Thank you! I though the magazine version was rather drab and uninspiring, but I really like your stripy version and it’s making me look at the pattern with fresh eyes. The ruffles are not over the top at all and make this an interesting casual top.